This book, now in its third edition, is written for lawyers, trade associations and marketing managers. It is one of the first to deal with the new regulations on dumping and subsidies which were adopted to implement the European Union's obligations under the Uruguay Round's 1994 Anti-Dumping Code and the 1994 Subsidies and Countervailing Measures Code. It places the highly complex subject of dumping and subsidisation in its WTO and EU contexts before taking the reader through a legal and arithmetical analysis of the technicalities involved. The book has been completely revised and expanded since it was last published in 1983, and provides many more worked examples, and draws on the much enlarged case-law of the European Court of Justice to illustrate the discussion. 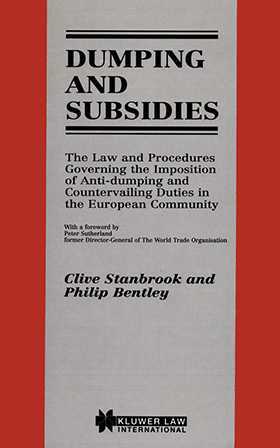 With more than ten years additional experience since the last edition, the authors provide a stimulating analysis of the turning points in Community anti-dumping law: revocation of undertakings, non-cooperation, five year sunset reviews, screwdriver assembly, anti-absorption measures, newcomer reviews, and now, with the new regulations, currency conversions, detailed rules on sampling methods, de minimis rules on injury, procedural deadlines, consumer interests and a new approach to circumvention. 1. Introduction. 2. The Community Framework. 3. Dumping. 4. Subsidies. 5. Injury. 6. Community Interest. 7. Procedure. 8. Refunds and Reviews. 9. Judicial Review. Index.